When I messed up the Oopsie, I made something even better! I love experimenting in the kitchen with new ways to spruce up my low-carb lifestyle. It's one of the things that I enjoy about livin' la vida low-carb the most--making it interesting by coming up with new recipes and food combinations that suit my sugar-free, low-carb life. When you put a little creativity behind it, there is no limit to what you can come up with. Just look at the Oopsie phenomenon, for example. Created by Cleochatra from "The Lighter Side Of Low-Carb" blog, this neat little recipe for making a low-carb "bread" replacement using some rather simple low-carb ingredients is a prime example of ingenuity at work. The possibilities for recipes are truly endless with these Oopsies. Next, I headed for the refrigerated section to get the cream cheese and you can't buy the off brand--you gotta get the good stuff, so that means Philadelphia cream cheese. I already had the Splenda, eggs, and salt at home, so I went to the checkout and went on my merry way to go make some Oopsies. With all the stress of the past couple of weeks, it was time to relax and unwind the cares of this world in an Oopsie kind of way. I was rip-roaring ready to go. Following the basic recipe for making an Oopsie and doubling it, I did as instructed and separated the six egg whites from the egg yolks. In the bowl with the egg yolks, I added a block of cream cheese, 2 packets of Splenda, and two dashes of salt. Meanwhile in the other bowl with the egg whites, I added the obligatory two pinches of cream of tartar. So far, so good, right? Welllllll...then I made my uh-oh. Rather than whipping the eggs white mixture until "stiff," I whipped it to oblivion and it was a big bowl full of foam. EEEEEK! What a dopey thing to do, Jimmy! Hoo boy. I didn't realize my mistake until I read in the instructions about carefully folding in the egg yolk mixture so you won't "break down the whites." OOOPS! Too late. Now what? I went ahead and used my mixer to blend the egg yolk mixture and carefully tried adding it to my egg white foam. The bowl was getting too full, so I got an even bigger bowl and just poured both the egg white and egg yolk mixtures together and stirred 'em all up. What was supposed to be this nice thick batter for making the Oopsie rolls was more like a very, very thin pancake batter. HOO BOY! What can I do with this? But, like my accidental low-carb "magic shell" recipe last year, this recipe actually turned out to be a blessing in disguise. Little did I know just how amazing this uh-oh was gonna turn out to be. When I pulled it out of the oven, the pan appeared to be filled with a cinnamon cake of sorts. I pressed my finger against it and the top was spongy, so that was a good sign. After a few minutes of allowing it to cool, I decided to take a bite for myself. OH...MY...GOSH!!! This tastes unbelievably good! I ran and got my wife Christine to take a bite and she couldn't believe it either. Could lightning strike again on one of my kitchen disasters and turn it into something extraordinary? Yep, it sure can and it did! This is always a unique moment for cooks when they stumble upon something new. I commented to Christine that it sorta tasted like French toast with the cinnamon, so I cut a slice on a plate, put some butter on top, poured a little sugar-free pancake syrup on top of that, and then scooped a dollop of whipped cream for the finishing touch. It was so rich and yummy, you'd never know it was basically cream cheese and eggs for the "bread." INCREDIBLE! My wife said, "If you have a sweet tooth, then this sure will take care of it." Indeed. In a bowl, mix the eggs, Splenda, salt, cream cheese, cream of tartar, cinnamon, and the sweetener of your choice (I used erythritol, but any sweetener--besides SUGAR!--will do) together with a mixer until blended and creamy. Spray a baking pan (I used a 10 X 7) with non-stick spray and pour the mixture into the pan. Bake for about 30 minutes until it resembles a cake. Let cool for a few minutes and then cut into squares. 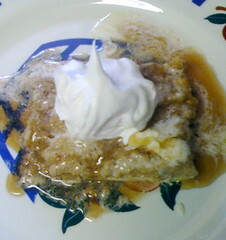 Put desired amounts of butter, sugar-free pancake syrup, and whipped topping on top and ENJOY! Serves 6-8 and the net carb counts per serving are around 4-6 grams. Im all about the mouthfeel not the aesthetics. You made me hungry!!! LOL,, I am going try this in the morning.. sounds so good!! I'm so happy you are merrily blogging along again! Your modified recipe may not require the use of cream of tartar because "Cream of tartar is best known in our kitchens for helping stabilize and give more volume to beaten egg whites". I know that I can only remember using it when beating just eye whites to help form stiff peaks. I still haven't tried the original oopsie, so I'll have to give both recipes a go. Awesome job The Mumma! Sounds great! I also thought of using Banana DaVinci Syrup and nuts for a banana nut bread, too. The possibilities are endless. :D THANKS for sharing! Just wanted to tell you, I enjoy your blog and get a kick out of your humor! Also wanted to say that I a so sorry about all the stress you've had to deal with. Blessing to you and yours! I made a half recipe of his tonight to try it out. I left out the cream of tartar and added a pinch of baking powder instead plus a dash of RealLemon and a splash of vanilla extract. Instead of baking it, I cooked it on the stove. I made some thin crepes, thicker pancakes and I made some scrambled like eggs. All three were fantastic. I think I will make just the scrambled ones next time and eat it like oatmeal for breakfast. It was the quickest and tasted just like the other ones. Jimmy if you whites were frothy foamy you didn't beat them long enough. it takes several minutes to get stiff peaks with room temp whites. Looks delish, don't you love happy little mistakes? Some times they turn out marvy. I would like to ask you to give mine and a friends cereal recipe a try if you would. I'm sure you could make improvements on it. I so miss cereal and this holds up to milk...yeah! THANK YOU Nancy Ellyn! If I didn't care about the people who come to my blog, then I probably would have packed it in a long time ago. But I ain't going anywhere. :D THANKS again for your support. When you give it another whirl, you want the egg whites to look like airy whipped cream. They should be glossy and firm, and when you lift the beaters up, little peaks should stand straight up. It also helps if you add some of the fluffy egg whites to the egg mixture to lighten it up a bit before you gently fold the egg mixture back into the whites. I'm never good at the "sweetener to taste" and was wondering if you could give me an idea of how much sweetener to add and what kind? If you like a little sweet, then try one packet of Splenda or whatever sweetener you choose. If you like a lot of sweet, then use two and maybe three. You probably won't need more than that. :) HOPE THIS HELPS! Twas delicious. I had it for breakfast this morning and brought it for lunch today. mmm.